Back in 2009, I made a trip to Hat Springs, Nebraska which is in the NW corner of the state. This was my 1st trip out west & to Merriam turkey. It was a great trip with good people & was also a trip of 1sts for me. 1. To meet Noreasttrkyhntr, Bob & Catdaddy, Tom, face-to-face. We have known each other for 6+ years on the board. Great pleasure finally meeting him. 3. To see & cross the Mighty Mississippi. There was a tremendous amount of flooding on the IL side, at least we think it was flooding. There was a lot of water in the woods on both sides of I80. 5. To see wild antelope. 6. To see wild mule deer. 7. To see the official State of Nebraska No Hunting sign. 8. To meet two of Nebraska’s finest people. 9. To ride up & down the mountains in Old Blue. 10. To see a wild Merriam’s hen. 11. To kill a Merriam’s gobbler. 12. To complete my Grand Slam. 14. To go 9 days without watching TV. 15. To go 9 days without access to the NWTF site specifically & the web in general. 16. To almost hit a deer at 75 MPH in IN when at least 3 decided they needed I80 East bound more than I did. Another first. Following in my footsteps. John, Carol and Old Blue. guesswho wrote: Another first. Following in my footsteps. John, Carol and Old Blue. That be them. Good people. When were you out there? HunterGKS wrote: When were you out there? I was there in 2005. We were there the weekend they were catching and branding calves. Should have heard him explain to us what they do to the calves . 1. Swapping stories/experiences with them. 2. The food. The only hunting camp where I have eaten better was/is at Gobbler's Roost. It was great & you never left hungry. I don't think they had the antler tree when I was there. I don't remember seeing it. You must be talking about making boy calves into it calves. They had some really nice looking Angus. There were 3 of us in camp & we knew each other from the old board. One day we all drove up to the deer hunting cabin. I'm not sure if I have pics but it was way up on top of 1 of the "mountains" with some great views. Did you ever make it up there? I also hunted in the Walk-in Area next door & experienced another 1st, being stalked by the same coyote, twice. Kinda scary. Great pics Huntergks .. country & animals looks pretty much like where I was near Chadron, but I had less trees and more open pasture & crop land, an where I hunted was mainly trees on stream areas. 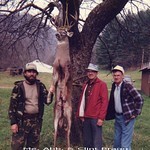 I did hunt a mountain pine area once. Sure love those cow & calf herds!! Thx Charlie. If memory serves, we were just a few miles east of Chadron on the north side of SR20. Pretty country. We did go to the cabin. His cousin and his family were coming in that weekend to spend some time there. I also hunted a place around Chadron the year before. Like shooting chickens. I love the country up that way and there's some fine people, but I didn't care for the hunting. That's why I haven't went back. There were 3 of us hunting & we did all get birds but we worked/walked our asses off to get them. probably as tough a hunt as I have ever been on. I'll post the story soon.